Coconut Charcoal Activated - Nature's Way®. 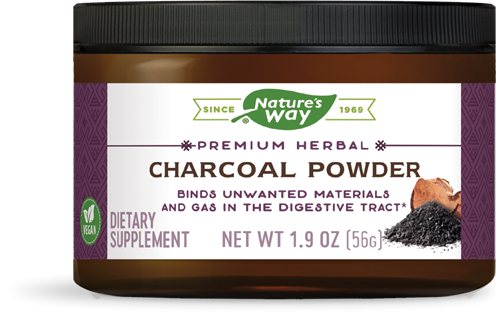 Nature's Way® Charcoal Powder is made from slowly burning coconut husks to create cavernous chambers that aid in adsorption. Nature's Way is committed to sourcing the best activated charcoal on the planet, and seeks out partners who prioritize sustainable sources of charcoal. Take 1/2 teaspoon (tsp) (800 mg) once a day, 3-4 hours before/after meals, or as recommended by a healthcare professional.